Each day of this Passover holiday I've posted a gourmet way for Jews to honor the commandment to eat matzah, aka "the bread of affliction": eight easy recipes that are friendly to modern tastes and diets, and with a little less added affliction. Today is the last day. Enjoy it! Previous days recipes include: Spring Matzah Pizza with Asparagus, Goat Cheese and Potatoes; Porcini-Stuffed Chicken Breast in Red Wine Sauce; Matzah-Crusted Beef Tenderloin; Salted Caramel Ice Cream Cake; Matzah with Brie and Caramelized Onions; the North African egg dish, "Shakshuka"; and Julia Child's "Trout Meuniere." Yesterday I wrote about the dire cravings of my children for pizza and pasta during Passover, and offered this gourmet subsitute recipe for pizza. Today I offer a substitute for pasta, courtesy of my new "spiralizer", a gadget I can't recommend highly enough, especially if you, like me, love pasta but not its calories. I use this all year -- not just during Passover -- but it's been especially useful this past week. Basically it will turn many vegetables into spaghettti, but some obviously work better than others. I've had the most success with zucchini: it's firm enough to take the shape of pasta, and only needs to be sauteed for a couple of minutes to be perfectly cooked. Moreover, even those (i.e. kids) who might complain they don't like zucchini could be won over when having it served this way. 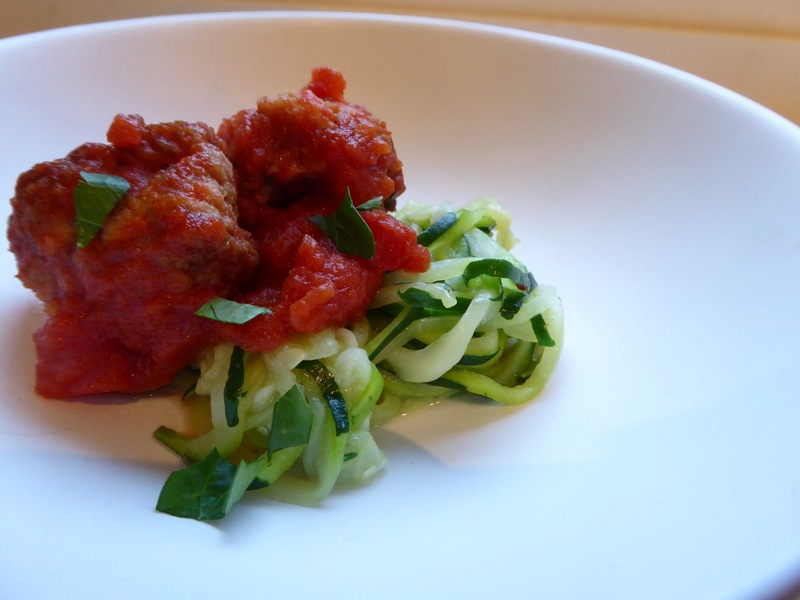 For this zucchini "pasta," I adapted a classic Marcella Hazan recipe for meatballs in tomato sauce to a matzah friendly version. I also subsituted turkey for beef to make it lighter. When it's not Passover, just replace the matzah meal with bread crumbs. I hope you've all had a lovely holiday -- and that these recipes have made it a little more endurable for everyone. Follow me at Fig Tree & Vine for more gourmet recipes and inspirational ideas for spring. First, make the meatballs in tomato sauce. In a large bowl put the ground turkey, onion, parsley, the egg, matzah meal, olive oil, and nutmeg and integrate using a wooden spoon. Then gently knead the mixture without squeezing it (too much handling will toughen the meatballs) until evenly combined. Make 1-inch meatballs. Choose a heavy saute pan that can accommodate all the meatballs in a single layer. Pour in enough vegetable oil to come 1/4-inch up the sides. Turn on the heat to medium high and when the oil is hot, slip in the meatballs. Brown the meatballs on all sides, turning them carefully so they won't break up. Remove from heat, tip the pan slightly, and with a spoon remove as much fat as floats to the surface. Return the pan to the burner over medium heat, add the tomatoes with their juice, a pinch of salt, and turn the meatballs over once or twice to coat them well. Cover the pan and reduce the heat to cook at a quiet, but steady, simmer for about 20-25 minutes, until the oil floats free of the tomatoes. Taste and correct for salt, add freshly ground pepper, and serve over the zucchini pasta. For the pasta: While the meatballs are simmering, wash and trim both ends from the zucchini, and "spiralize" them into pasta whirls using the pasta blade on the spiralizer. Toss with a sprinkling of salt and set the finished pasta in a large strainer in the sink until the meatballs are ready. Turn the meatballs off and let sit while you squeeze out any remaining moisture in the zucchini using paper towels (it just occurred to me you could do this in batches in a salad dryer: I didn't try this but experiment!). Heat the olive oil in a large saute pan over medium-high heat. Saute the zucchini until cooked and lightly browned, approximately 2 minutes (you may have to do this in a couple of batches). Remove to a serving bowl, toss with more salt and some shakes of chili pepper, and pour the meatballs and sauce on top. Serve immediately. For more content like this, and beautiful modern products for Jewish lifestyles, please visit www.figtreeandvine.com. Fig Tree & Vine is a new and stylish destination for contemporary Jewish living. Follow us on Instagram @figtreevine and Facebook, or subscribe to our newsletter.